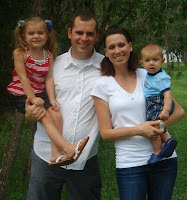 Unlike Easter this year, we were lucky to have Matt home for the Fourth of July weekend. Actually Matt was home for 5 days, and that was a surprise to me. I thought that he was coming home on Thursday night, and found out that he was really coming home on Wednesday night! And, then I thought that he was going back to work on Monday, but found out he was really home until Tuesday! Nice for us! On Friday morning, Matt got up and played paintball with the usual crew from our ward. He's always happy when there is a paintball game planned and he is home for it. 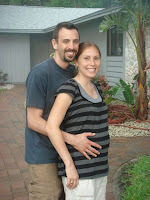 That afternoon, my brother Chris and sis-in-law America came up from Ft. Lauderdale for the weekend. Chris is in PA school right now, so he practiced looking into our ears and looking at our eyes with his instruments. Momo got her Dr set out and looked as well! That night I got to go out for a girls' night out with my mom and my sister Stephanie, along with America, her sister Angela and their mom Ana. We went and saw The Proposal. It was way funny, and I had a blast being out with the girls. Thanks Matt for taking the kids for the evening! 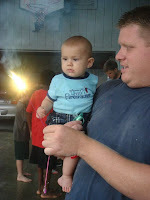 On Saturday we went to the Bergers' house for a BBQ and some fireworks. Andrea Jarvis and Red Red. 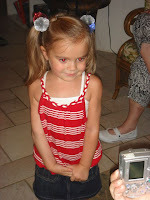 Sweet Momo with her firecracker hair-puffs! 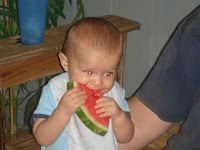 The BBQ was yummy, and Reddin ate a whole piece of watermelon. 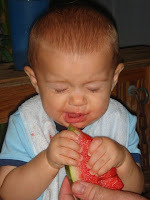 Travis got a piece of watermelon and put Reddin on his lap, and then he let Reddin go to town on it! It was pretty cute, since he just barely turned 6 months! While we were eating there was a major downpour. We thought that might stop the fireworks for the night, but after checking the forecast, we saw that it would pass, and it did! Got to love the FL rain! The storms usually hang around for about 30 minutes to maybe an hour! 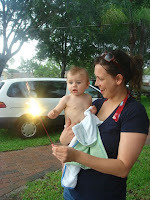 We took the kids to the front and let them do sparklers. 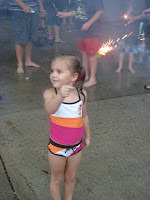 Then we headed out back for the rest of the fireworks. I'm not sure if the kids have nearly as much fun as the dads! I swear the inner-boy comes out in them all when explosives are involved. It was a good time! After that we cleaned up and headed home. 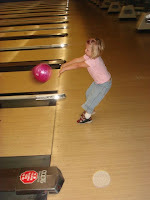 This morning we took Mattie bowling with her friend Lilli, who is visiting from Nebraska. Matt and I decided to join in, and it was my first time bowling with the bumpers. 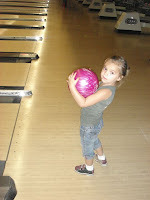 That was probably a good thing, since I haven't bowled since before Mattie was born! Our extended weekend was a lot of fun, and hope that everyone else had a great one as well! We are extremely grateful for this wonderful country that we live in, and can't even begin to express our gratitude to the men and women who fight with honor for us to continue to enjoy our blessed USA. A HUGE thank you to all of you wonderfully brave soldiers! Reddin is TOO cute! Momo too, but I'm dying at his sweet disposition. Looks like a great weekend. How nice to have Matt home! We missed you! FUN, FUN, FUN! Looks like a great weekend :)! 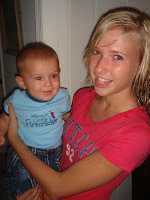 I can't believe how big Reddin is getting! 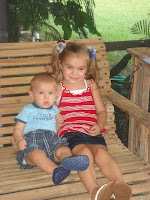 Miss those kiddos!!!!! What a fun weekend! I love all of the pics, especially of Mattie & Reddin. Momo's hair is getting so long! We sure hope we'll be seeing you in a month!